Giants catcher Buster Posey, who ascended from Class A Advanced San Jose to the Majors in less than six months, was named the winner of the 50th annual J.G. Taylor Spink Award as the Topps/Minor League Player of the Year for 2009 on Tuesday. 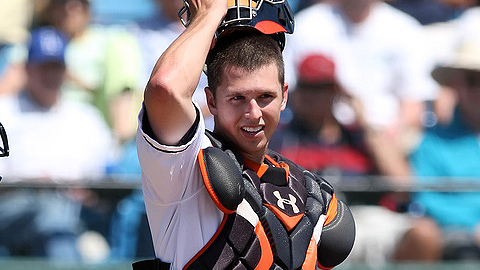 Posey, 22, rose through the Giants' system after splitting his second pro season with San Jose and Triple-A Fresno. The Leesburg, Ga. native, who hit .351 in 10 games as a rookie in 2008, batted .325 with 84 runs scored, 80 RBIs, 18 home runs, 31 doubles and a triple in 115 Minor League games before making his big league debut with San Francisco on Sept. 11. "It's obviously always a big honor when you are recognized and look at the guys who won it before you," Posey said Wednesday. "I found out from my friends. Actually a couple of my buddies sent me a text when I was at the [Arizona Fall League game Tuesday night]." The Florida State product was the No. 5 overall pick in the 2008 Draft by the Giants and had no trouble proving himself as a pro. He dominated the California League to begin the season, batting .326 with 13 homers and 58 RBIs in 80 games with the Giants despite missing time after getting hit in the head in June. Posey was named California League Hitter of the Week on April 20 after beginning the season batting .405 with 10 RBis in his first 11 games. He fell a triple shy of the cycle on April 26 and drove in 14 RBIs in a six-game span from May 18-23. The Giants ended weeks of speculation on July 14 when Posey skipped Double-A Connecticut and joined Fresno in the Pacific Coast League. He was ranked as the No. 5 Top Prospect in the Minors by MLB.com at the July 31 Trade Deadline after beginning the season at No. 14. The former Hawaii Winter Baseball All-Star quickly adjusted to Triple-A pitching, batting .321 with five home runs and 22 RBIs in 35 games with the Grizzlies, driving in a run in each of his first four games. He matched a season high with four RBIs on Aug. 4 against Tacoma and homered for the second straight game the next day. With a dozen hits over a seven-game hitting streak Aug. 31, the Giants finally called up the 6-foot-1 backstop. Posey, who ranked 14th in the Minors with a .416 on-base percentage, appeared in seven games with the Giants and collected his first Major League hit in his second gameas a pinch-hitter against the Dodgers on Sept. 19. He reached base in his first eight starts with Scottsdale in the AFL this month. "There's always room for improvement," he said. "I just got to keep working hard over the winter and continue to get better." The award, named after J.G. Taylor Spink, the publisher of The Sporting News from 1914 to 1962, is awarded by the Topps Company of New York in conjunction with Minor League Baseball. Brewers infielder Mat Gamel won the award in 2008. The Baseball Writers Association of America also present an award in Spink's name annually for meritorious service in baseball coverage. Danny Wild is an editor for MLB.com. Brittany Ghiroli contributed to this report. This story was not subject to the approval of the National Association of Professional Baseball Leagues or its clubs.